A Georgia native, Ward was the first African-American to apply to the University of Georgia School of Law—a challenge to that school’s discriminatory practices. “Ward rejected an offer by the Georgia Board of Regents to pay him the difference between instate tuition at UGA and out of state tuition anywhere else—a state policy that had helped perpetuate segregation in the public university system. Instead, in 1952, Ward sued the state for admission to law school at UGA, becoming the first African American to challenge Georgia’s segregated university system,” wrote R. Robin McDonald in a profile published in the Daily Report. The lawsuit was not successful, but it set the stage for future litigation. Ward came to Northwestern Law for his legal education. Following graduation, he returned to Georgia and a distinguished legal career. In 1960, he was part of the legal team that won a victory in the Georgia Court of Appeals, securing the release of Martin Luther King Jr. from the Georgia State Prison after he had been arrested during a sit-in demonstration. 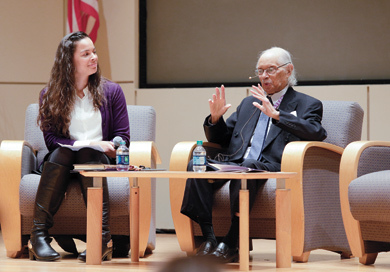 In 1961, he represented Hamilton Holmes and Charlyne Hunter, two African-American students, in the lawsuit that forced the University of Georgia to desegregate. Ward was the second African-American ever elected to the Georgia State Senate and the first African-American to become a Superior Court judge in Georgia. He was appointed to the federal bench in 1979 by President Carter, and served as a US District Judge in the Northern District of Georgia until 2012. The Law School presented Ward with the Distinguished Alumnus Award in 2015. The award honors extraordinary contributions to the legal field. Funeral arrangements will be handled by the Alfonso Dawson Mortuary in Atlanta and have not yet been announced.